Apart from thinning the paint, irritating the skin and quite effectively removing nail polish; it also thinned my fingernails. 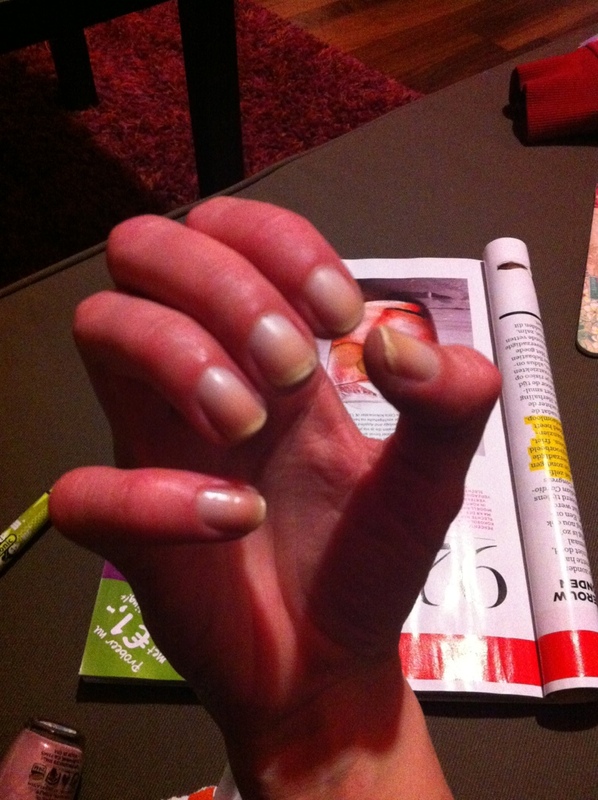 This was about 6 months ago and you can see the difference between healthy and desperately damaged nails. There is a palpable thickening where the healthy nail starts, and I have to keep my nails polished because the tips are so brittle it tears and keeps on snagging everything! I’ve been looking forward to playing with fondant all week, ever since I had the brilliant idea to make cupcakes to hand out for my birthday. I had all these marvellous designs in mind. The cupcakes -vanilla, chocolate and lemon- turned out a bit sweeter than expected, even though I used my standard recipe for divine cake. 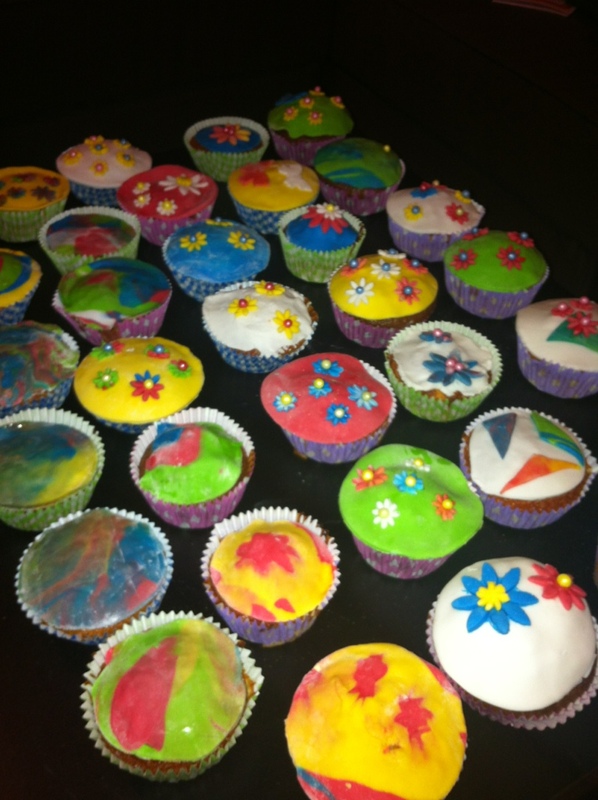 I added some food colouring for the hell if it: lemon is yellow and vanilla is pink. I started out all inspired, trying to make leaves and shapes. And butterflies that fly. Then I got a bit tired, and decided my floral punches were my best friends, along with sugary pearls. 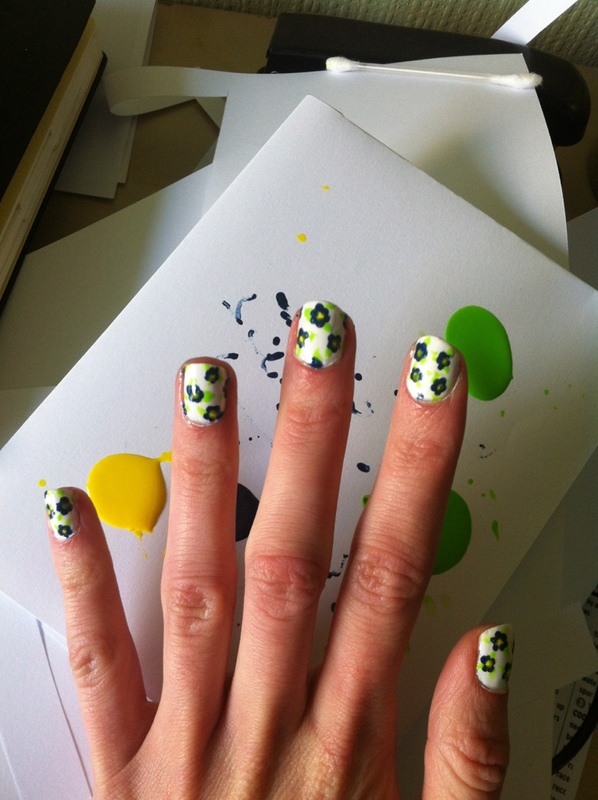 Then I discovered marbling, and how quick it is to cover them if you marble a pretty pattern. The best looking ones are the tiny flowers. It’s the first reasonable day of spring and although its not the sunny 22 degrees they promised (and I didn’t believe)… I’m having a good day. First off, I went for my first run in a long time, and it felt good. Lousy run, but it’s a start towards my first 5k race. 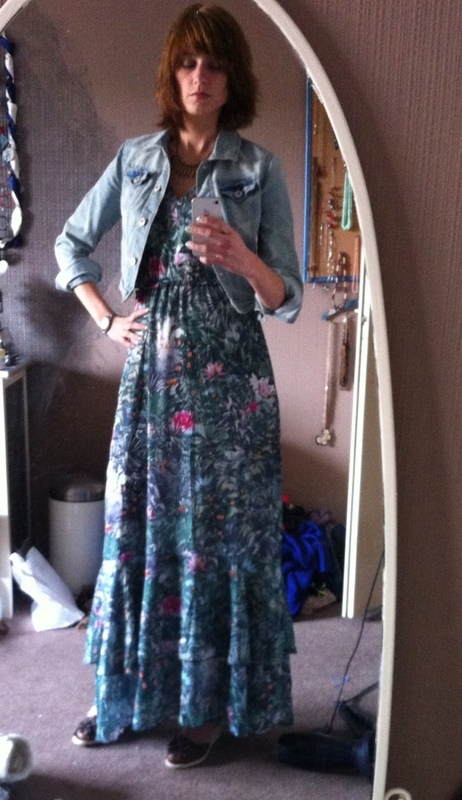 Then, I get to wear my maxi dress, finally warm enough for that. Clothes aren’t important, but they can cheer you up!! And then I talked with some lovely people at Crossroads International Church. Ah now see: believing in the weather leads to glum and disappointment. Believing in God leads to sunshine in your heart. How’s that for a spiritual Sunday message? Behold my activity for this afternoon as I am impatiently waiting for it to dry. Decided it would be a nice cheery thing for spring, but I forgot about the drying time and I forgot that its complicated to go to the bathroom with wet nails. But, I’ve managed not to ruin them too much! I have also done my laundry apart from the sheets which have nowhere to dry. I have obsessed a bit over running a 5 k ladies run, showered and made a smoothie. Then discovered that I was too late to pick up the bag I took to be fixed. Oh, and I sorted out work out clothes and tidied up a bit, I don’t have enough short sleeved work out shirts! And now I am simultaneously reading blogs, figuring out the WordPress app and reading up on running gadgets, oh, and checking out where to get cheap work out shirts. Yeah typical day of doing nothing!! Time for another post, and time for another useful (or, so I like to imagine) ADHD post. But, also quite useful for anyone who likes organisation or who owns more than five tee’s. My recent project (almost finished…) was to switch winter and summer clothes. The reason behind the switch is overview: there technically is enough space in my wardrobe for all my clothes, but I find it easier if I can’t see the stuff I won’t be wearing for a while for obvious reasons (such as summer dresses being a bit chilly in the snow). I have a lot of clothes, and I’ve impulsively bought too much over the past years. I’ve been guilty of buying something I NEED or MUST HAVE double because I forgot that I already owned something similar… And simply put: being organised as much as possible really helps if you’re a chaotic type. 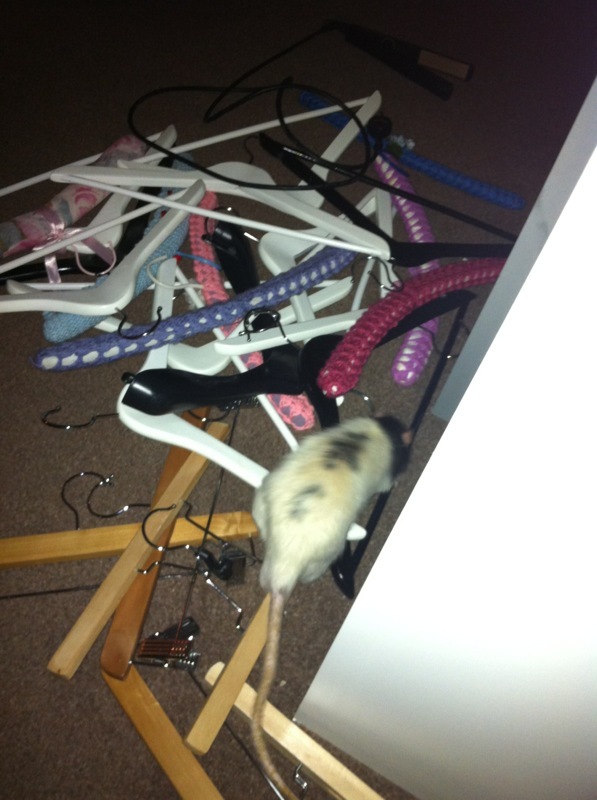 In my previous home I had a walk-in closet (shuffle-in-sideways), which was ideal. I lived there for a year, before that most of my clothes have been stuffed inside a small wardrobe, boxes, or simply somewhere in my room. Every now and again, I’d discover things I didn’t even know I had. When I got the walk-in, I organised the stuff and had space to put it all. Then I had to move, and just had too much stuff. And somewhere, I got a brilliant idea: to turn the hooks on the hangers, and I worked it out to something that works, more or less. So, here comes. – Bakers twine, string, ribbon, whatever. 1) Start by designating an area/basket/bin for things to toss, things to consider, things to store. 2) Then start with something easy, like shoes. Get all shoes on one heap, clean out closet space where shoes were. Try on shoes, check their state. TOSS: everything that is not fitting, too worn or simply something you haven’t worn in ages and shouldn’t have bought in the first place. Don’t literally toss straight away, wait till the end of the method. CONSIDER: The shoes you can’t make up your mind about. STORE: the shoes that will only be taking in space for the next half year because the season literally is wrong for them. TIDY UP: The rest. Put them away neatly, paired and sorted. If needed, cleaned. I took a pair that needed fixing straight to my ‘to do’ pile in another room. You can put a piece of paper in the shoes, which you’ll remove when you wear them, so next time you do the wardrobe switch, you’ll know what you haven’t worn. I skipped this, as I don’t have a massive amount of shoes. WRITE DOWN: what you may need to get, now that you have a nice overview of what you have. 3) Easy wasn’t it? Next: socks and underwear. Same procedure. TOSS: non-fitting, worn or torn. WRITE DOWN: what you may need. 4) Now, for the most work…. clothing. Same procedure once again. One big heap, or… if you’re ‘advanced’ you’ll now already have a closet with ‘marked’ items, which you can remove immediately and TOSS, more about that later. Clean out the closet. 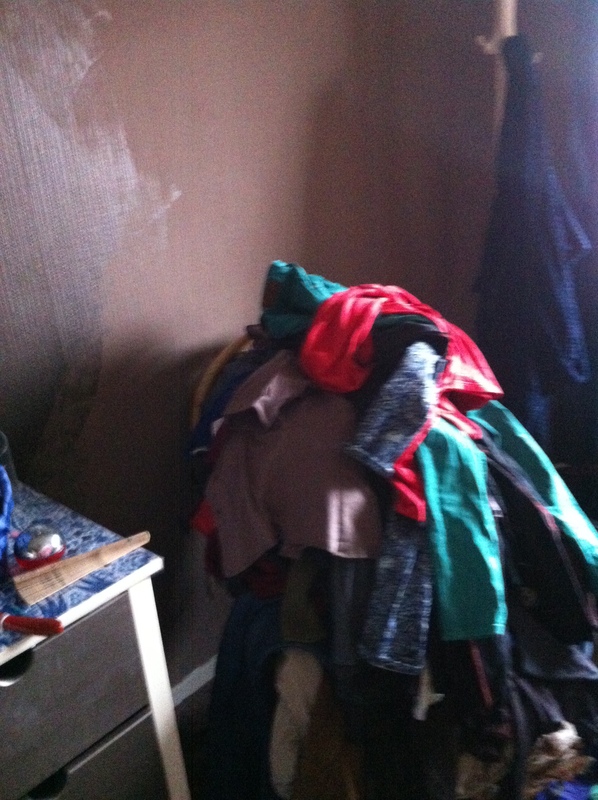 Sort out the clothing, AND the clothing from storage. TOSS: clothes you’re not wearing anymore, clothes which are ripped beyond sublte repair, stained, don’t fit, are worn or which you shouldn’t have bought anyway. 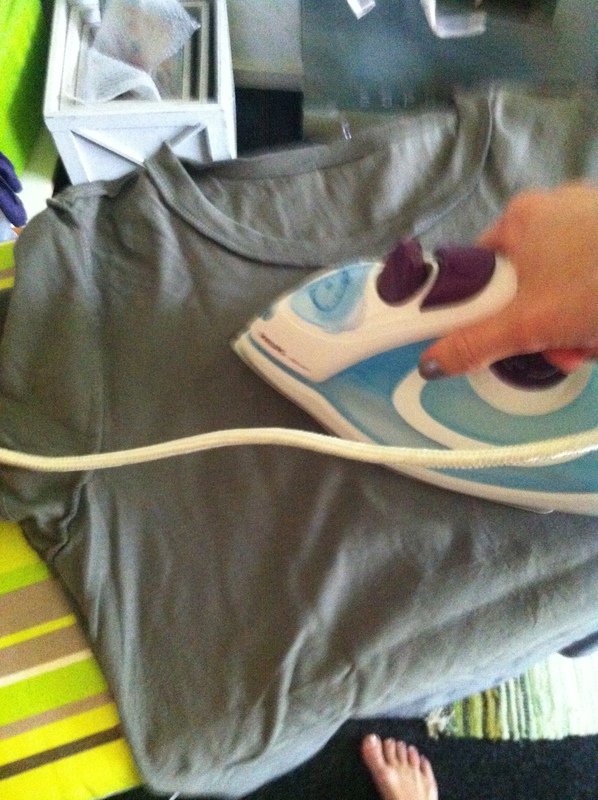 TIDY UP: Iron what is needed, you’ll thank yourself later. Sort: shirts with shirts (I have a pile of sleeveless, short sleeved and long sleeved), trousers with trousers, etc. Now here comes the catch: Turn hooks on hangers ‘backwards’ when hanging them, put folded clothes in the closet inside-out and tie a piece of string to the things that can’t be folded inside out. WRITE DOWN: what you need. 5) If you’re anything like me, you’ve broken that up in pieces. You can do the same with your bags and accessories, I’m sort of sorting out belts and have forgotten about sports clothes. Now, pick up the CONSIDER heap/bin/bag. Go through it impulsively: would you feel happy in this: TIDY IT UP. No? TOSS. Put the great stuff up for sale, or give it away to someone that will give it a good home. Consider doing a clothes swap. Take things in reasonable condition to the YMCA for example, and the rest goes to recycling. H&M has this new thing for recycling fabric. Smile, you now have space! 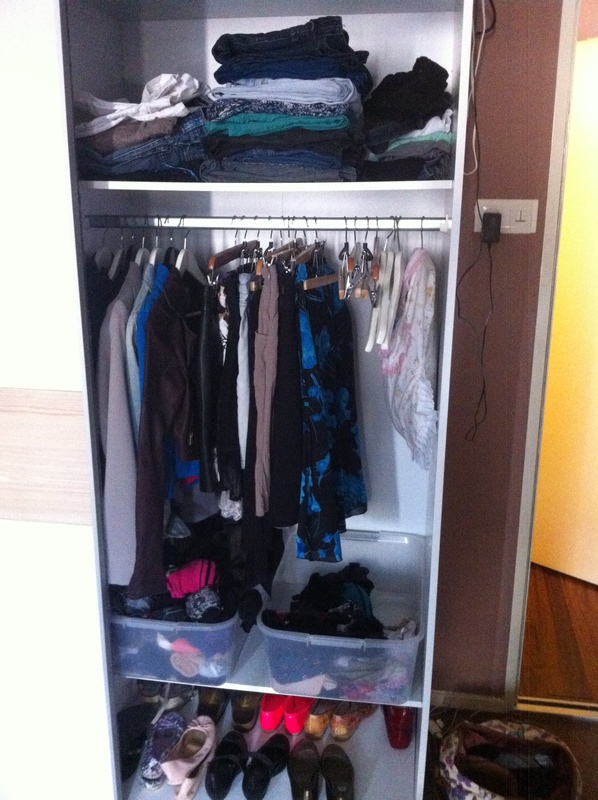 Voila, you now have a sorted out wardrobe full of clothes you can and will wear. Gives peace of mind in some sense!! 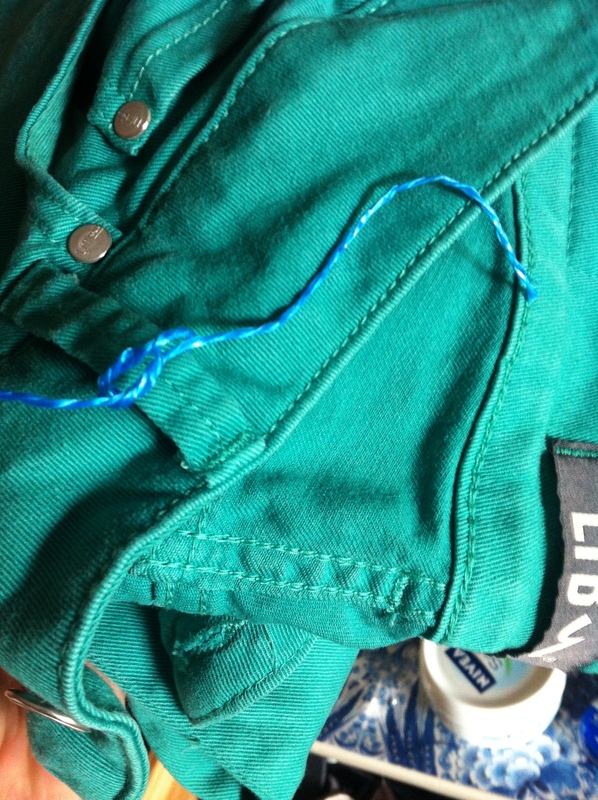 – you had a reason to not wear them, that will change in the foreseeable future; such as my hatred of the colour purple last summer (I normally love purple) or the fact that I had no real reason to wear my ‘neat’ trousers for a season, but I will be needing them soon. In general, you’ll wear fashionable items for a few seasons, unless they’re incredibly dated. Of course, if you have a massive home with no intention to move anywhere ever again, you can have a attic full of ‘vintage’ clothes in ten or twenty years, but my life is fluid and besides, in 20 years time my body will have changed. Bags can be kept for this reason, and shoes. It helps to keep a smaller TOSS bag around from time to time, and do TOSS things that get written off during the season as soon as this happens! I found doing this for a year now very handy, and also quite insightful about my own style. I’ve learned that I do not need another t-shirt because I have about 40, for example. I got a few outfit-ideas along the way. Clothes are meant to be worn, not to be kept in closets. 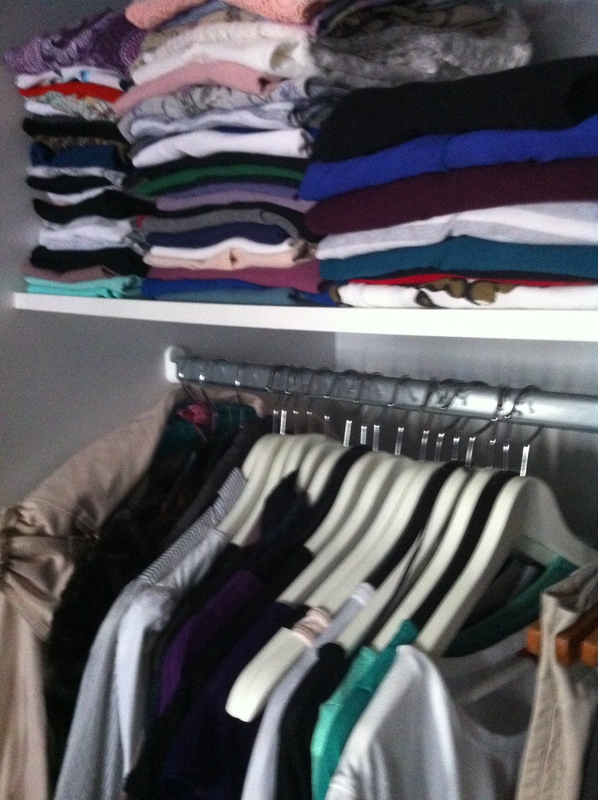 I get to enjoy the benefits of an organised wardrobe, wear clothes that fit and have overview in the mornings. (Of course, this requires normal tidying up from time to time). No more looking for THE OTHER SHOE for example. Somebody else gets to enjoy the clothing you don’t, perhaps even somebody who can’t afford it. You may get some cash from selling. Also: reusing and recycling is very eco-friendly. Win-win, right?